Ambrell’s equipment helps clients increase their production efficiency. Induction heating offers tremendous possibilities for delivering localized heat with short cycle times. One of Ambrell’s customers is adding more production lines. Although that company has been using our EKOHEAT 50 kW power supply, for this particular application they require less power. 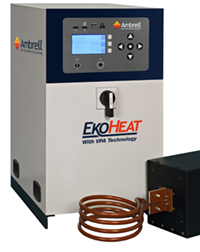 Ambrell’s engineers performed complimentary applications testing with a 15 kW EKOHEAT with VPA Technology generator and a custom-made coil. The application testing met the client’s objectives. If you need induction heating solutions and expert advice to enhance your process, Ambrell is your partner thanks to our versatile equipment and superior engineering expertise. Does the EKOHEAT’s capabilities and our applications expertise impress you? Read more in our new brochure. Production efficiency is an important challenge in any production process. If you are currently thinking of applying induction heating to minimize energy use and footprint, we offer a free of charge consultation and testing service. And this convenient on-line form will help us understand your heating challenges and scheduling an appointment in one of our application labs worldwide.